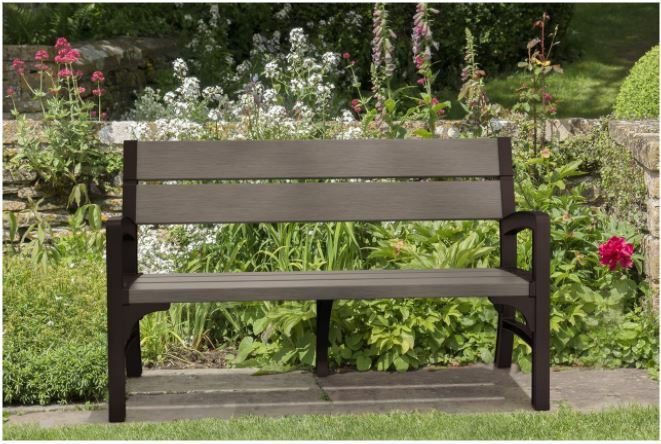 Keter deliver the smart solution for a resin garden bench seat to escape the inconvenience of yearly upkeep hassles concerning rot & rust with DUOTECH innovation, a design that radiates ultra sleek styling whilst composed to subsist continuous weather stresses. If you’re presently contemplating outside bench seating, one that’s unsusceptible to weather decay, read on, I’m sure this will impress. 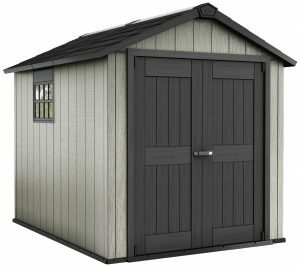 Although this website specifically promotes low-maintenance outdoor storage solutions, the Montero furniture range constitutes the same Duotech composition Keter’s newly designed resin garden sheds are engineered with and quite remarkable feedback they are receiving. 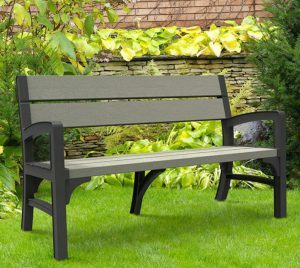 Throughout my duration of writing various articles associated with the Duotech manufacture, I many times think: Wouldn’t it be wonderful to have garden bench seats composed out of the same weather-resistant material to escape headaches related to rot & rust, and here we are. 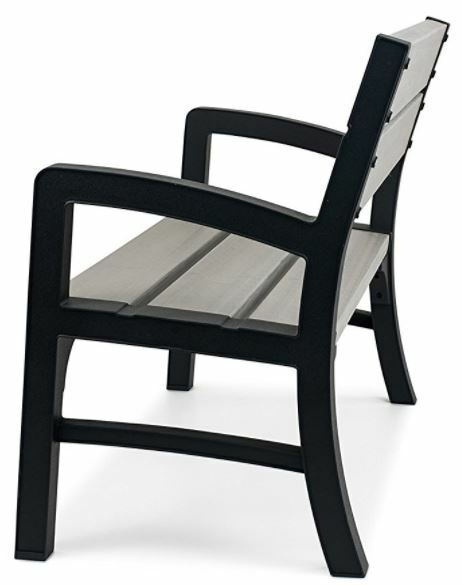 Keter’s Montero collection of outdoor furniture consists of single chairs, two seater benches, three seater garden benches and tables, designed to mix & match to complement any outside space from balconies, patios, BBQ areas, backyards and garden locations however their beauty regards ease of maintenance; whilst resisting decay, they’re a cinch to clean. I’ve always received the yearly maintenance duties regarding preservation work on our family’s outdoor wooden seating. I find sanding this type of furniture down the most laborious & frustrating job a few years down the line. The first few re-coats of varnish from new, nurture the wood okay until sunburn attack delivers cracks, then the rot sets into the seating panels and arm rests where puddles develop. Once the structure becomes weak, you know you’re finished; time to replace. Keter’s new innovative Duotech design replaces upkeep headaches with a composition immune from weather decay therefore eliminating cracking & a decayed weakening structure developing. 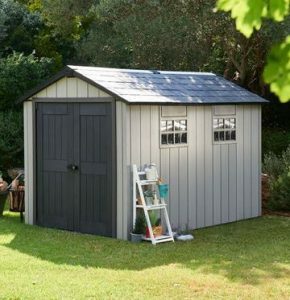 DUOTECH™ started off by designing three sizes of walk-in garden sheds named Oakland. Exhibiting their gorgeous rustic weathered silvery charm whilst constructed by a fast-efficient assembly procedure soon captured interest resulting in a plethora of sales however feedback received has been mightily impressive spurring Keter to expand their range. 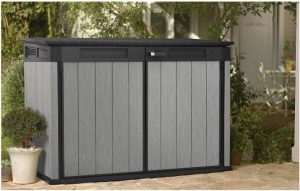 Furthermore, Keter released additional outside storage solutions including the High-Store, Grande-Store, Patio-Store, Brushwood Garden Deck Box and My-Shed, all composed with DUOTECH’s low-maintenance resin design. 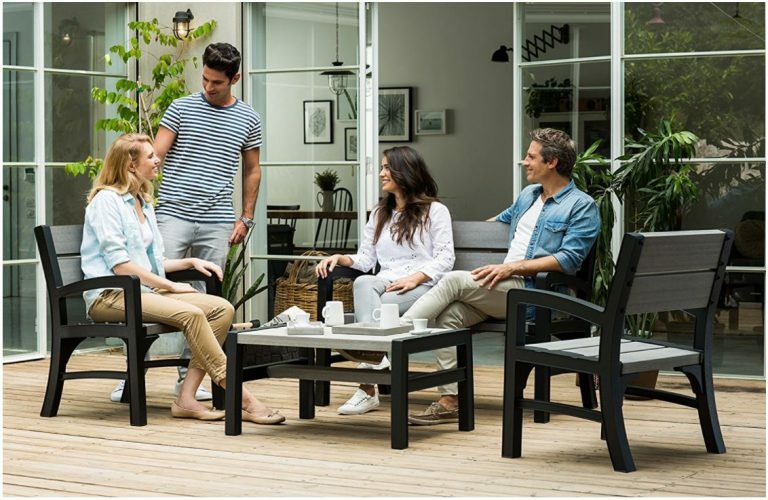 Attaining impeccable feedback throughout the entire range motivated Keter to design Duotech’s stylish weather-resistant composition into their Montero furniture collection. Images & links to in-depth reviews relating to DUOTECH’s additional low maintenance storage solutions are presented towards the foot of this post. DUOTECH’s composition regards cutting-edge technology, a unique composite mix of weather-resistant polypropylene inclusive of Keter’s secret resin talc formula. Revolutionary molding techniques deliver a wood-grain texture to the touch enhanced by the most sublime silvery weathered rustic appearance. Polypropylene is not susceptible to weather decay bringing an end to rotting issues no matter what the weather throws, be it driving rain, stood in a pile of snowfall or a constant damp environment, a future absent from preserving re-coats of varnish, paint & stain; but what about sunshine? The dire consequences relating to unprotected plastic suffering sunburn attack usually results in a severe bleaching effect occurring and structural cracking to the make-up. Stabilising the initial stages of Duotech’s resin mix regards UV protection, armouring the composition with defence to subsist the demise in appearance colour fade succumbs to and a splitting construction developing. Duotech delivers a weather-resistant make-up ensuring no decay disintegration entails whist suffering the elements yet designed effortless to clean. Either a wipe down with warm water, detergent and a soft brush or the more common solution regards a light spray-hose down accomplishing the most simplistic of cleaning duties. 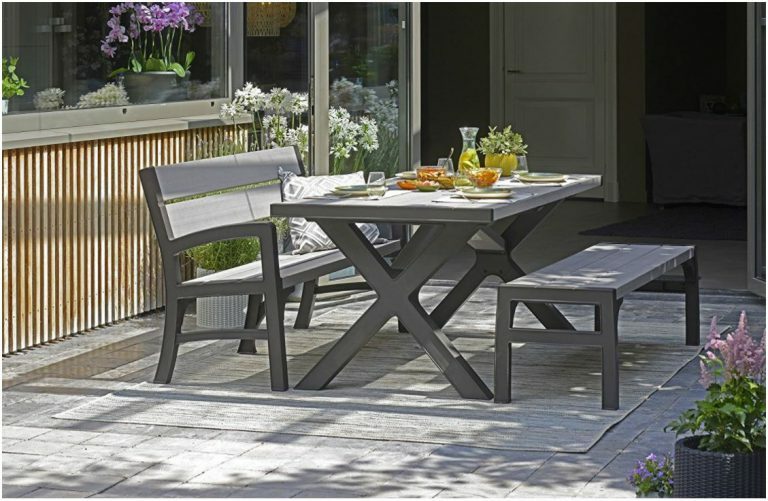 Montero furniture is environmentally friendly, durable, weather-resistant & virtually maintenance-free yet cleaning can only be described as a doddle to manage. 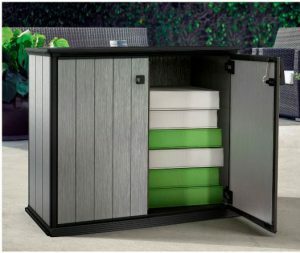 Keter describe their Montero collection as lightweight in design enabling effortless movement of the chairs, bench seats and tables to any desired spot or stored at a moment’s notice however they’re also described as strong and comfortable bringing peace of mind for accommodating adult weights. The facades on Duotech sheds are manufactured with identical composition relating to dual lined resin sheets however instead of the facade panels incorporating a ribbed internal structure that reinforce the sheds overall stability, the Montero seating panels are left more hollow to which strengthened supports incorporate internally delivering superior robustness underpinning the backbone of their seating position. The framework, armrests and legs exhibit modern stylish two-tone colours accompanying the facade’s silvery shimmer delivering elegance to any patio. 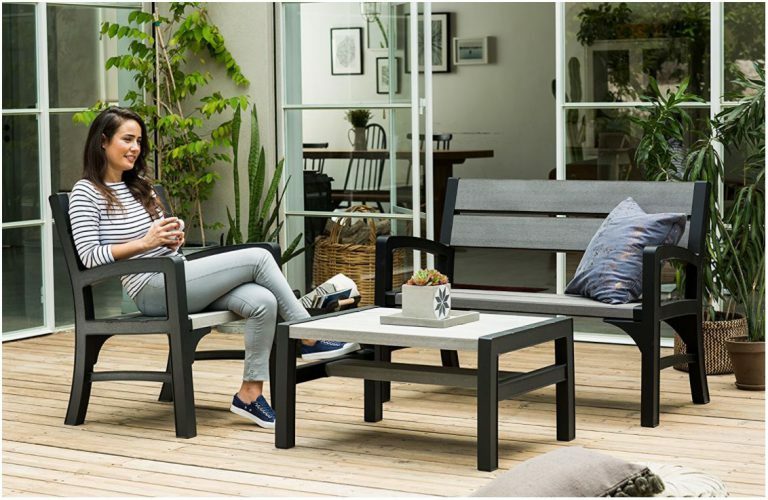 Positioned either side of the bench seats and chairs, arm rests provide adequate support as shown in the image above whilst the backrest reclines at a suitable angle accomplishing their comfy relaxed seating position. Assembling Montero’s bench seats and outdoor furniture regards a fairly swift construction procedure. Assemblers are required to work through the order of illustrated steps presented in the detailed instructions, implementing the process. A Phillips head screwdriver is the only tool required, the process is best described by clicking the parts into place and securing with screws, 12-14 steps completes the procedure, assembly made very straightforward. Here’s the Assembly Instructions for Montero’s 2 Seater Bench Seat to give an idea how straightforward the construction process is. Within an hour from unpacking the box you should be sat outside relaxing. 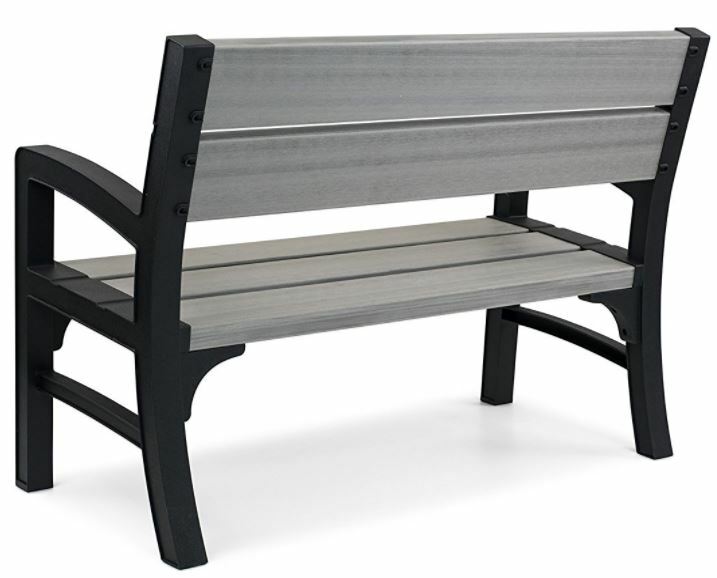 Keter are now manufacturing Duotech’s smart engineering into Montero’s garden bench seats, chairs and outdoor furniture delivering a superlative construction in terms of a weatherproof facade exhibiting modish style with resistance to decay. Accomplishing the upper-hand to sidestep conservation issues regarding sorting rotting wood, rusting metal and subsequent re-coats of varnish, paint & stain, superseded by the quickest of wash-downs that replenish their shine in minutes. 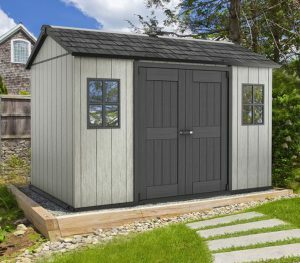 Oakland sheds receive high acclaim expressed through reviews for weather-resistance & quality construction however reinforcing confidence relates to the release of Duotech’s additional low-maintenance storage solutions that too acquire exceptional feedback. 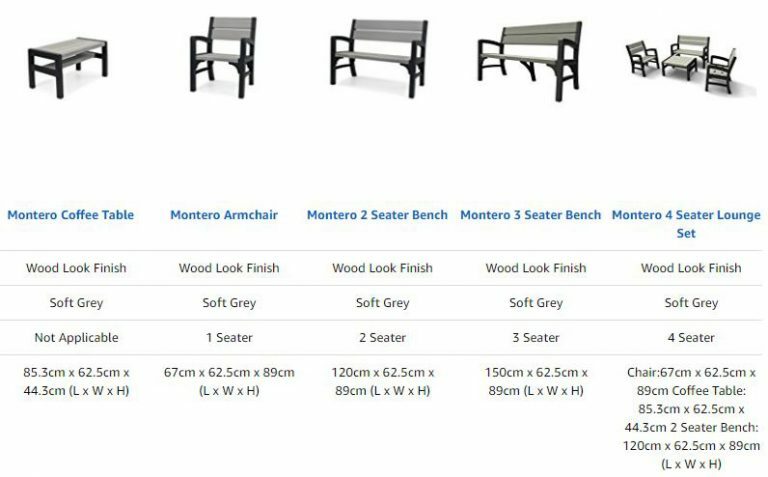 Although new to market, Montero bench seats & furniture are backed by contentment in terms of warranty cover, set to become another Keter Global best seller. 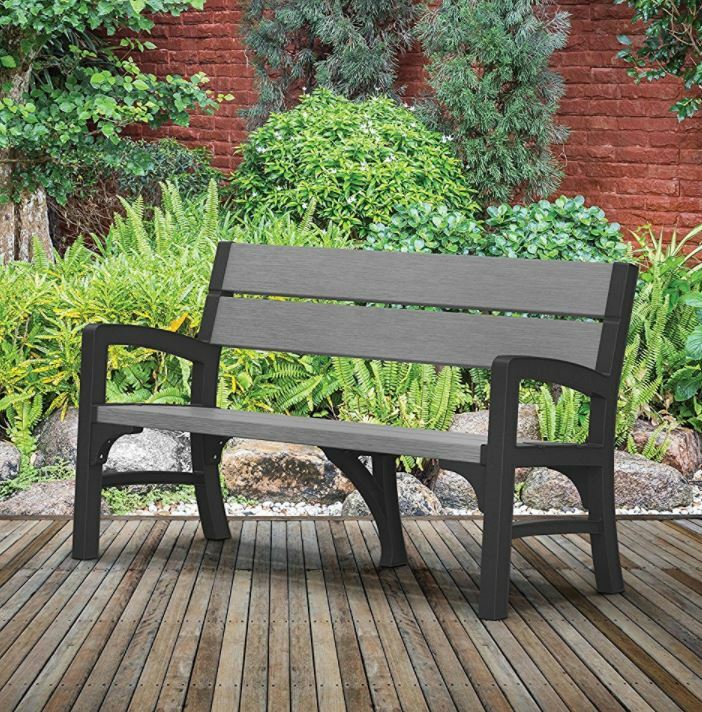 Thanks for reading the advantages Duotech’s resin garden bench seats deliver. If you have any related low-maintenance outdoor bench-seat queries, please share in the comment section below. Always happy to help. 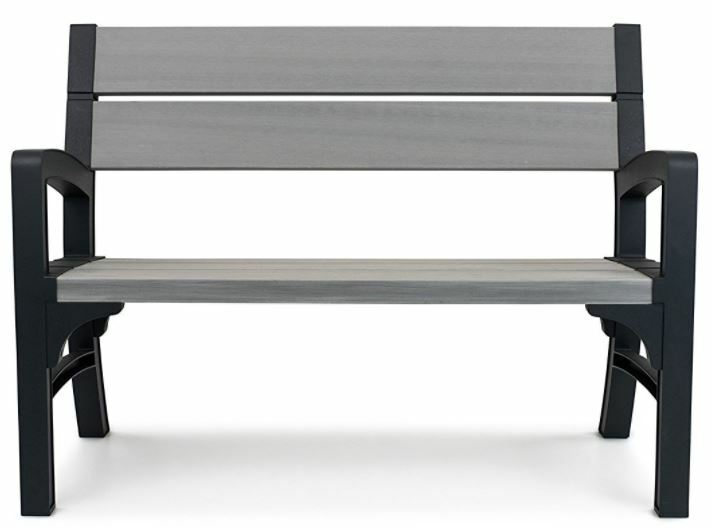 Please share Duotech’s Bench Seat with your social friends. Thank you! Getting ready to power wash and refinish my swing in the back yard, this gives me an idea on what to put in its place when it is finished. Do you know if it made from recycled materials, this would make it good for the environment. 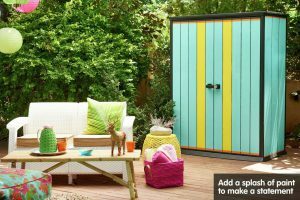 I like the idea of a complete collection of furniture for your outdoor space, to match all you furniture in one style and color. 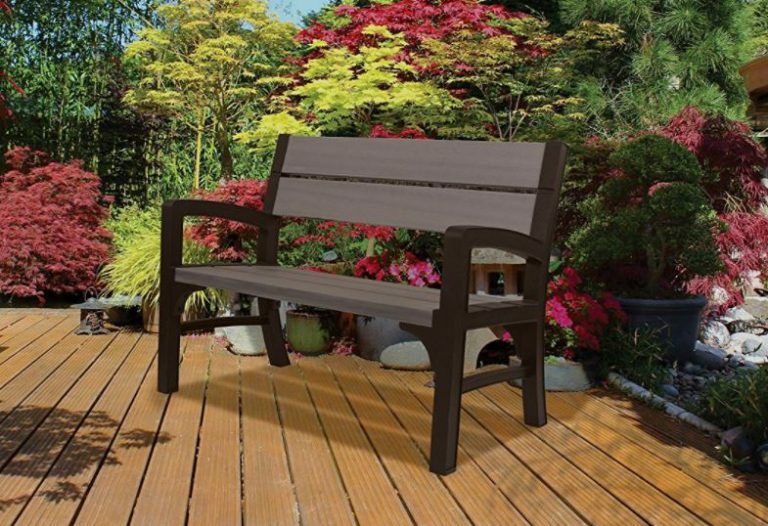 Hi John, thanks for calling in to read about Duotech’s resin garden bench seat. We’ve had a garden clear-up too John this last few weekends. Washed the patio down and planted another load of bulbs followed by spreading a load of mulch on top – we’re now ready for the coming spring to warm and brighten our back garden up. It can’t come soon enough this year, seems to have been a long cold winter, unless we’re getting older – ha! Duotech material is based on polypropylene which is 100% recyclable so can be used again & again into alternative products when the time comes to replace therefore is environmentally green however this unique configuration does contain a secretive addition to make the composition adhere to acrylic paint, a procedure to which Keter haven’t revealed their formula. A complete collection from a furniture range usually enhances outdoor spaces better than a mix & match procedure, there’s no doubt albeit for me John, being weather-resistant represents the bonus after being confined for years sanding outdoorsy furniture down and re-coating with wood-stain varnish, only to be repeating the process the following years until the rot takes over. 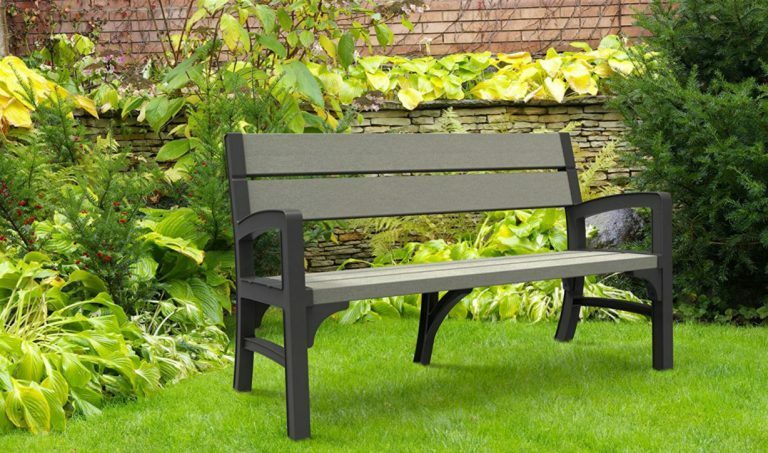 What a great review of the Resin Garden Bench Seat! I have just bought my first home and I am in the market for furnishings for my back deck. 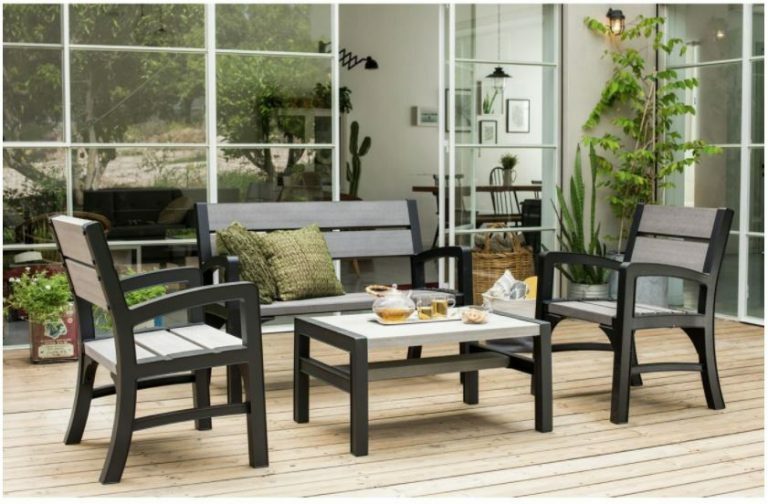 Theses seem to be of top quality and weather resistant, which is a big deal for outdoor furniture. I do have one question though. Are these available in other colors? While I like the grey look, they do not match the color of my house, and that is a big thing to the Misses if you know what I mean! Thanks for a great review it was very informative! 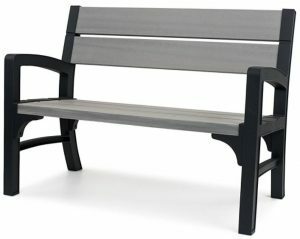 Thanks for dropping by to read the way Keter have manufactured this range of garden bench seats out of Duotech material. Finding sheds, storage facilities & outdoor seating to combat weather-resistance is a big deal for me too, conserving them starts to become a constant headache a year down the line. 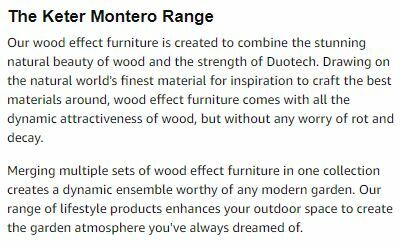 Montero furniture hasn’t been released yet as I write this comment. 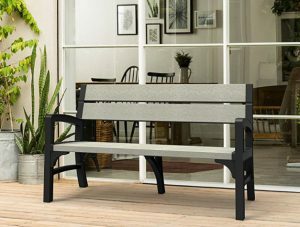 Where visitors are pointed towards within the prices section links to Amazon where you can pre-order the seating from from Keter, delivered once released. To my knowledge additional colours haven’t been introduced yet, these are presented in a modish style exhibiting a weathered silvered rustic shade however Duotech is paintable so there’s the option of painting the colour of your choice with an acrylic based paint if this route is preferred albeit a painted surface will require additional re-coats as time goes by, paint will inevitably fade.